When I was asked one time to bring hors d’oeuvres to a family party (all parties in our family are potlucks) I cast about for something new besides the regular old brie and crackers, and remembered a program I had seen on the Food Network. On this program, someone had been exploring the food traditions of this exotic land they called the American South, and had set forth at length about a cornerstone of this food tradition — pimento cheese. Bingo! I thought, homemade spreadable cheese. I figured my grandmother, at least would appreciate it. Googling will yield any number of recipes for pimento cheese — there seem to be as many variations as the day is long. Mine isn’t a copy of anyone’s in particular — I make no claims to its authenticity — I don’t even use pimentos, finding the flavor and availability of roasted red peppers, or if you can find them, piquillo peppers, to be much more my style. I also always use extra sharp cheddar, and Best Foods mayonnaise, because I only eat extra sharp cheddar and Best Foods (or Hellman’s) mayonnaise. What I do know is that when I ate this I fell madly in love, and now search out every opportunity to make pimento cheese. It’s just that good. Some pimento cheeses are chunkier — they use shredded cheese and chopped pimentos, and this is good, but mine is easier, dirties fewer bowls, and yields a mysterious neon orange color that is rarely seen in homemade foodstuffs, which adds an aura of novelty. 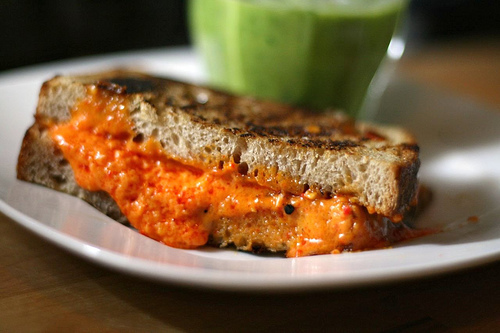 Once you have the pimento cheese, you can do anything you want with it. It’s good with crackers, or piled into celery. It’s good on apple slices, or on toast, but the best thing to do with it is make a grilled cheese sandwich. This is my favorite bread — it’s a type of French sourdough bread usually referred to as country bread, or pain de campagne, and it’s sturdy enough to stand up to the most flavorful of fillings and delicate enough to slice thinly and eat with butter and jam. 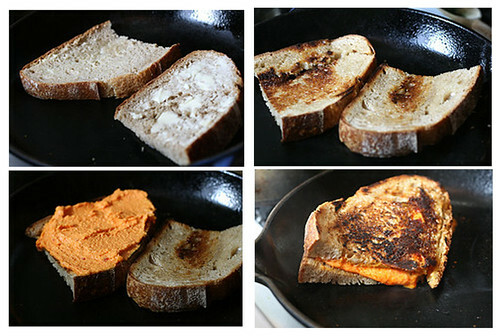 To make grilled cheese, I lightly butter both sides of the bread, then put them in a hot cast iron pan. When one side is lightly toasted, turn them, then add the cheese and make a sandwich. Turn, so both sides are evenly brown, and cook until the cheese is melted. The mayonnaise in the pimento cheese makes these awfully rich, but also very gooey and oozing with neon cheese. It’s a sandwich for the atomic age. Break the cheese into large chunks and place in the bowl of your food processor. Pulse until the cheese resembles gravel. Add peppers and garlic, process until mixture is finely chopped. Add mayonnaise and process until mixture is smooth. Add salt and pepper to taste. I will be making this one…my husband has requested pimento cheese, like they serve at Augusta for the Masters Golf Tournament. I have lost my original recipe…this one sounds great! Thank you. I will be linking this is a terrific site! The ooze alone lets me know this had to have been tasty! I really like the sound of this grilled cheese sandwich! Great flavours! This looks amazingly weird and delicious! ;D I LOVE bell peppers!! Totally gonna try this! What IS this fascination people have with pimiento cheese?! Everyone I know who is *not* actually from the South thinks it’s the bomb. Everyone I know who *is* from the South–myself included–finds it utterly alarming and wretched. That being said, I DO love your tongue in cheek tone in this post 😉 And I’m sure it tasted much better than, well, any other pimento-ish cheese has ever tasted. I am an expatriate Southerner living on the West Coast and can tell you that I was raised on pimento cheese and love it. When I serve it at our annual Kentucky Derby Party, there is nothing left on the platter but crumbs. I have never tried it with garlic, but a couple of tablespoons of grated white onions are a tasty addition. Also a 3 oz package of room temperature cream cheese helps the consistency. My mother always made her pim cheese homemade. It tastes nothing like that storebought junk! I make mine in the food processor as well I just use cheese, mayo, pims or roasted peppers AND some cayenne pepper! I had it spicey like that at Zoe’s Kitchen (deli chain) and I was in love. Granted theirs is very spicey and there is no disclaimer on their menu – so for some I’m sure it’s an unpleasant surprise. For me, it was sheer inspiration! Cheers!